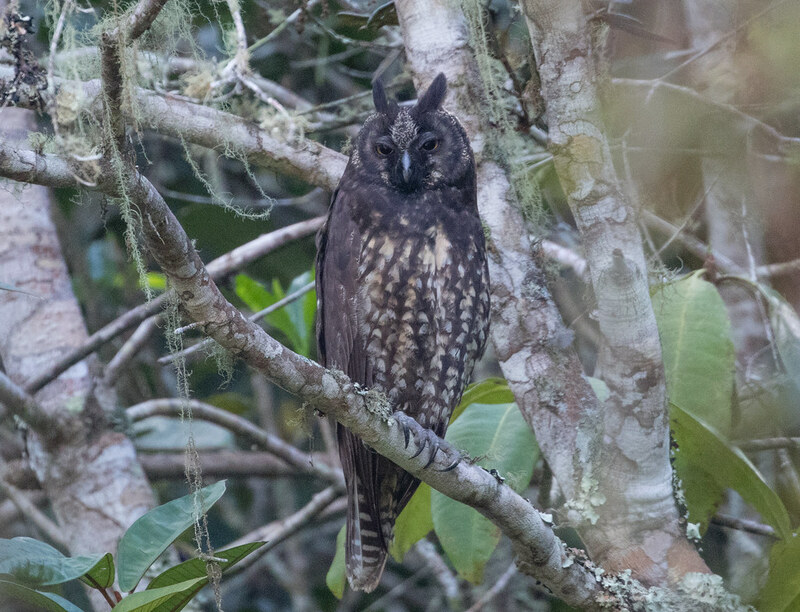 This large owl, related to Long-eared and Short-eared Owls, feeds mostly on birds, from tiny grassquits to tinamous and city pigeons. It ranges all the way from Mexico and the Greater Antilles through Central and South America, but spottily rather than in a contiguous range. It’s found mainly in open habitat, including urban parks. It’s been seen in Bentsen-Rio Grande State Park in south Texas twice, in 1994 and 1996, and in Key West, Florida, in 2018. (Read about that report in this ABA Blog report). Laura has seen the species only once, in northern Peru. Merriam-Webster defines stygian as “of, relating to, or associated with the river Styx: such as a) hellish, infernal, gloomy or b) characteristic of death, deathly.” It’s a name befitting this dark, secretive, somber-plumaged owl.